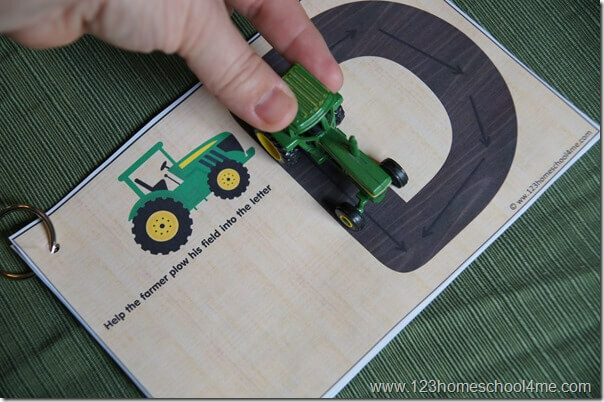 Kids will love practicing how to form their alphabet letters with this fun, free printable Tractor Alphabet Plowing Activity. If you’ve got a toddler, preschool or kindergartner who loves tractors, this activity is for you! 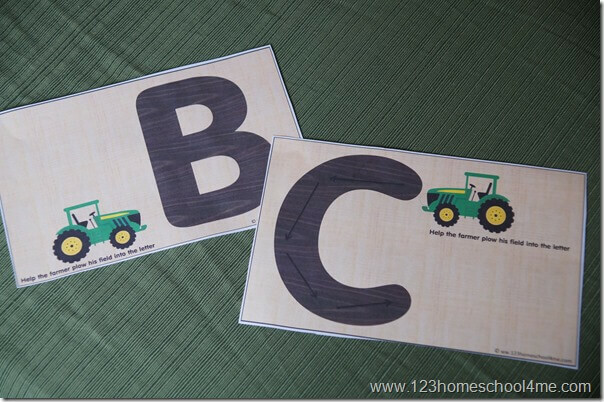 Kids will get to play with their tractor while practicing making alphabet letters at the same time! Simple print pages, use a laminator for durability (optional), cut apart and make into a book. We preferred to use these ring clips over stapling as it makes it more kid friendly to keep together AND play with too. There are two options for your book: with and without directional lines. For young children, children having trouble making their letters, and for children completing this activity mostly on their own, the lines are helpful to ensure they are practicing forming the letters correctly.